Jeremy McGrath was in a class of his own in 1996, winning all but one Supercross race. When the series turned outdoors, McGrath was again leading the way; that is, until he made a judgement error at Millville. The subsequent injury allowed Jeff Emig to close the points gap. History has proven that it’s not easy to knock an established champion off the top step of the podium; but every so often a rider rises to the challenge and slays the mighty dragon. Throughout most of the 1990s Jeremy McGrath was on a hot streak in Supercross. Affectionately known as “The King of Supercross,” McGrath was beyond comparison indoors. His accomplishments rewrote the record books. However, Jeremy wasn’t as untouchable once the racing headed outdoors. In fact, McGrath had only been nominally successful in motocross until 1995 when he captured his first 250/450 National title. 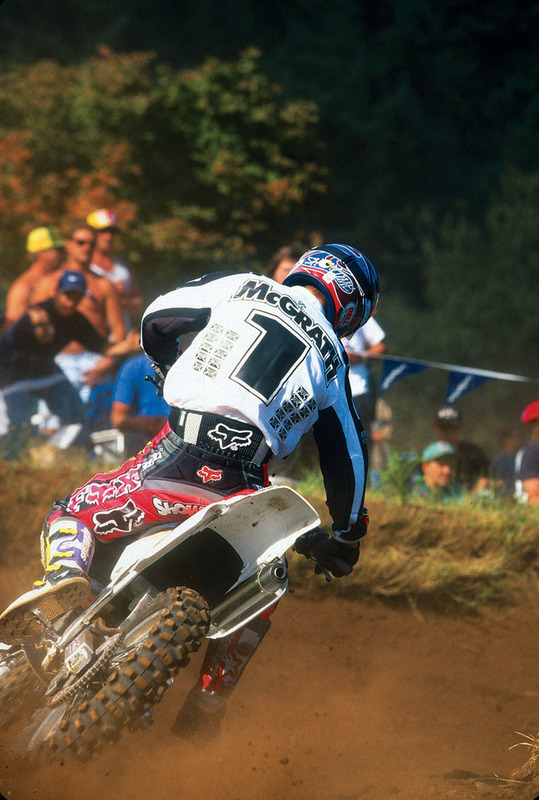 The 1996 season looked like it would be a clean sweep for Jeremy McGrath. The then three-time defending Supercross Champion rolled into the Supercross opener in Orlando on his Skip Norfolk-tuned factory Honda CR250 two-stroke. It was well-known that McGrath was riding on a 1993 CR250 disguised to look like a 1996 model. Jeremy used the 1993 frame, which he won his very first Supercross title on, throughout his career at Team Honda. Jeremy was unstoppable indoors, stringing together 13 straight main-event wins; however, he couldn’t stay off the ground in St. Louis, effectively handing the win to his arch nemesis, Jeff Emig. McGrath stormed back to win the final Supercross of the series in Denver. It was the most successful Supercross season ever for a rider up to that time. Little did anyone know that the McGrath/Emig sparring match would reach a fevered pitch in the summer of 1996. Jeff Emig rode with grit and determination in reeling his arch nemesis, Jeremy McGrath, in. It all came down to the Steel City finale, where Emig rose above to win his first 250 National crown. What began as a dominant effort by Jeremy McGrath in the AMA Nationals—he won the opening three races—turned into a flip-flop in the point standings as the series schedule entered the homestretch. Jeff Emig stalked McGrath throughout the early part of the 250 Nationals, hoping Jeremy would make a mistake. It took until Millville before Jeremy faltered. His demise was of his own doing. McGrath tried jumping a table-to-table double and came up short, severely stretching the tendons in his left foot. Emig went 1-1 on the day and gained valuable points, while McGrath went 9-7 for sixth overall. 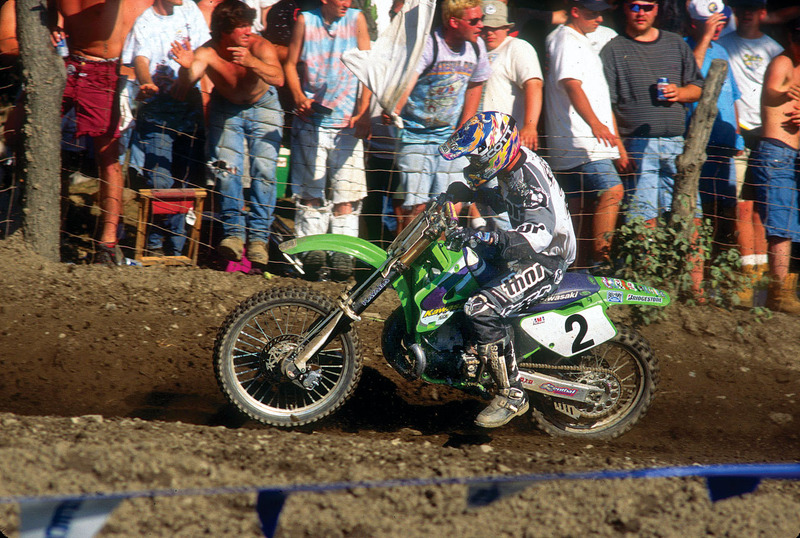 The following round, held in Washougal, was the coup de grâce for Jeff Emig. He finished second overall, while McGrath’s lingering foot injury sent him to the pits early (something he would regret later). Jeremy’s 9-32 moto scores erased his points lead. With two rounds remaining, Jeff Emig was suddenly up eight points on McGrath. At the penultimate round in Binghamton, New York, McGrath came storming back to win both motos. He closed the gap and trailed Emig by two points heading into the final round in Steel City, Pennsylvania. What happened on that September 1st afternoon in southern Pennsylvania at Steel City is still discussed nearly two decades later. Jeremy McGrath knifed past Jeff Emig in the first moto to take the lead. It appeared that McGrath would sail away with the win and recapture the points lead. But, it didn’t happen. Emig fought back and made an aggressive pass on his rival for the first moto victory. Jeff was five points ahead going into the final moto. Obviously, the turn of events in the first moto resulted in a massive confidence boost for Emig. Jeff rode on rails for over 30 minutes to claim the second moto win, the overall victory, and his first 250/450 National crown. Emig would also win the title the following year, while McGrath never challenged for the outdoor title again.